My homebrew club is focusing on German wheat beers for its March meeting, so today I brewed up a batch in preparation. Based on past experiences, I knew that German wheat beers are tasty, but maybe not something I wanted five gallons of (especially given the relatively short shelf life for the style). Given my brewing equipment and available time this afternoon, I decided to go for a 2.5 gallon batch of an all-extract beer. My mash tun holds 10 gallons, so I was worried that a half batch (2.5 gallons) wouldn’t hold temperature for a sufficiently long time, and I didn’t feel like simultaneously learning BIAB, so extract seemed the way to go. As I read up on the style, I ended up thinking that a simpler brew would be best. Because I was using all-extract, I elected to use distilled water to keep the mineral concentrations down. In my reading, it became apparent that extracts already have the minerals from the mash. For a lighter beer like this, using my (already heavily mineralized) tap water to rehydrate might ding the flavor a little bit. We’ll see how it works out! The recipe itself is named after Christian Erich Hermann von Meyer, a nineteenth century German paleontologist who studied Plateosaurus, perhaps one of the best known dinosaurs of Germany. I was using a Bavarian malt extract, and Plateosaurus are plentiful in Bavaria, so all of the elements add up! I heated 3.25 gallons of distilled water to a boil, turned off the heat, and added the dry malt extract. Once the mixture returned to a boil, I added the hops pellets and boiled for 60 minutes. After 60 minutes, I cooled the wort down to 70° using my chiller and transferred it into my carboy. The gravity was a little high (1.052), so I diluted the wort slightly by adding another 0.25 gallons of water. This brought my starting gravity exactly where I wanted it to be. I pitched the yeast directly from the vial into the wort (no starter needed for this small of a batch), agitated the mixture, and set it in my fermenting chamber. I plan to ferment at 64°. Based on what I read, this temperature can result in a more balanced clove/banana aroma than fermenting at a higher temperature. Starting gravity was 1.047, with ~2.67 gallons in the fermenter. After 10-14 days, I will bottle the beer. 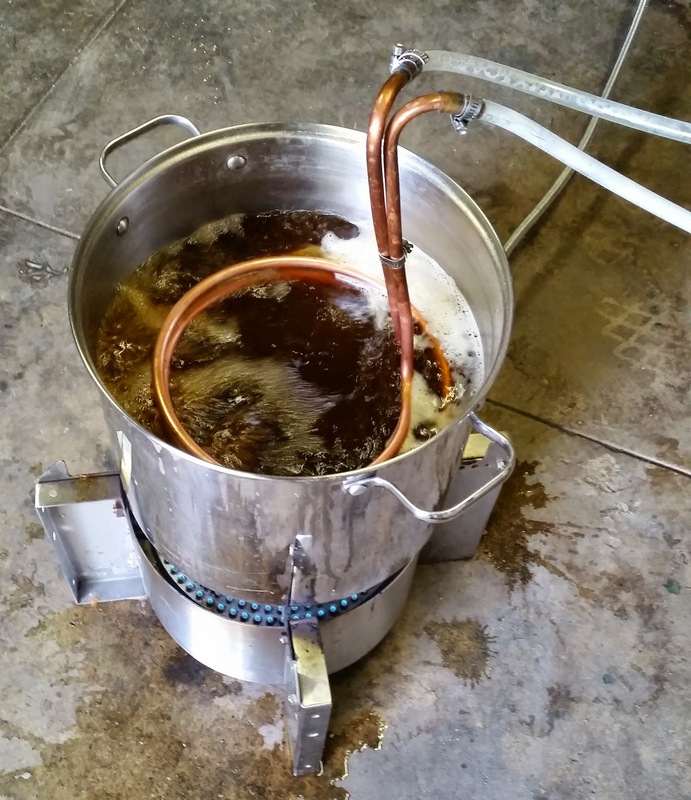 This project reminded me of one of the great pleasures of extract brews–rapid brewing and short clean-up! I spent maybe 2.5 hours max on this, for everything from pulling out the equipment to washing the brew pot. This entry was posted in wheat beer and tagged VMW, von Meyer Weizen. Bookmark the permalink.